Ponds are a fantastic addition to a garden, whatever its size, and not as difficult to create as you might think. Water in a garden has an enormous value to wildlife – bugs such as pond skaters and water boatmen live in the water, birds can drink and bathe in it, and amphibians such as frogs, toads and even newts will make a home there too. With this additional wildlife in residence, your plants will benefit too – the amphibians are great slug-eaters, and the increased insect diversity will attract other bugs that will feast on aphids and other plant pests. Plus, of course, all this life is fascinating to observe. But you don’t have to dig a great big hole! 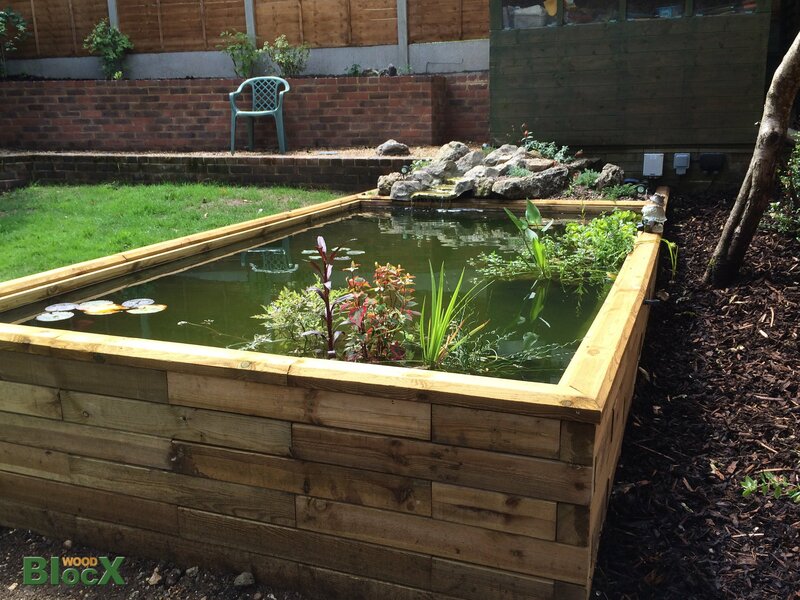 By using the WoodBlocX pond system, you can create a raised pool that can be put on any surface – even a patio – allowing you to incorporate water into your garden very easily. The pond is just as easy to assemble as their other raised beds, and they will even calculate what size liner you’ll need. Choose from a pre-designed pond kit, or design your own (they can do all the difficult calculations for you). All ponds benefit from a variety of plantings, to offer the most interest to you as the gardener, and the most habitats for the different types of wildlife. Broadly they can be divided into three types – the oxygenators, the floating plants and the marginal plants. However you plant up your pond, always make sure you include some kind of ramp for creatures such as frogs and birds to get in and out of the water safely, otherwise they may drown. Marginal plants. These are the plants that live at the water’s edge – and while they like their roots to be in permanently damp soil, their foliage and flowers are borne above the surface. Yellow flag irises (Iris pseudoacorus) and a variety of rushes and reeds will give a natural look. You’ll need to construct shelves around the edge of your pond (standing the pot on a brick is fine!) for the plants’ pots to sit on at the correct depth – check the label for this information. Floating (also known as aquatic) plants. Water lilies are the most popular of this group, and lovely to include. They are available in a range of colours, but Nymphaea odorata types will add fragrance as well as beautiful flowers. Oxygenators. These are essential to keep the water healthy, but can need reducing every year to prevent them taking over the pond. Most live submerged in the water. Good ones for smaller ponds include Hottonia palustris (water violet) which bears purple flowers on the water’s surface in spring and Eleocharis acicularis (water grass). 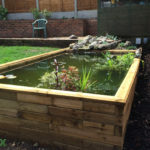 To really complete the look, some WoodBlocX ponds offer the ability to add beds at the side of, but not part of, the pond – plant these up with a bog garden and you’ll have a beautiful, calming and wildlife-friendly pond in no time.